To all the brothers at Number 12. You’re invited to Kayleigh’s party. Dress fancy. Come fancy. Dance! Once upon a time, there lived Cinderfella – a little boy, forever bossed around by his two older brothers, Gus and Gareth. “Turn up the TV! Shine our scooters!” the brothers cry. 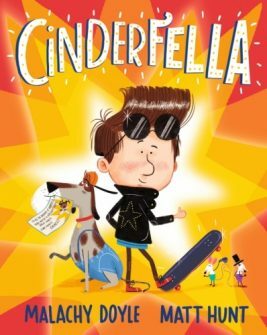 “Finish our homework!” But on the day of our story, Kayleigh, the town’s kick-fastic karate champion, is having a party, and Cinderfella is determined to dream big, dress fancy and DANCE. He’ll just need a little help along the way from his fairy dog-mother, Ruff – woof! A feel-good twist on the classic fairytale, brought to life with fresh vision and huge humour by Matt Hunt.